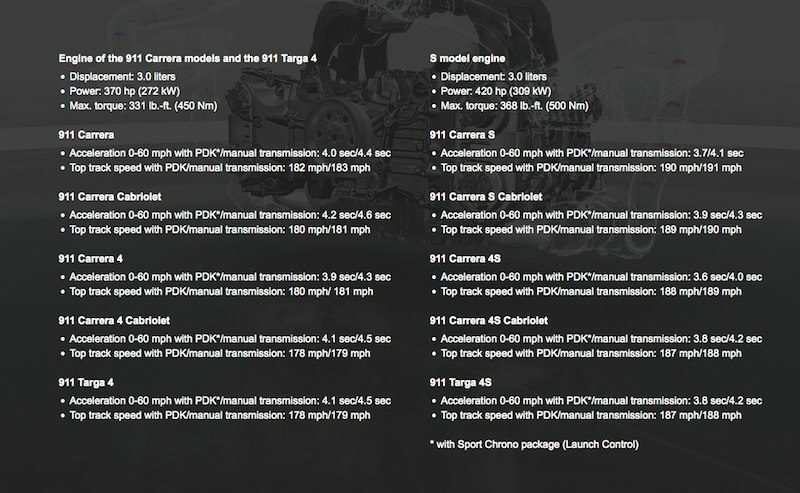 What Makes Porsche’s New 3.0 Liter Turbocharged Carrera Engines Special? As you've seen from our recent review of the 991.2 Generation 911 Carrera and Carrera S, we really like the new three liter turbocharged engine. Porsche has managed to make everything better in the new engine versus the one it replaces. The base and S engines both produce 20-horsepower more than the engines they respectively replace, while achieving higher and more easily accessible torque numbers, improved fuel economy, and better performance figures than ever. Porsche wants to focus on the driving experience with this new model, and has imbued the engine with more performance and efficiency than you could expect. 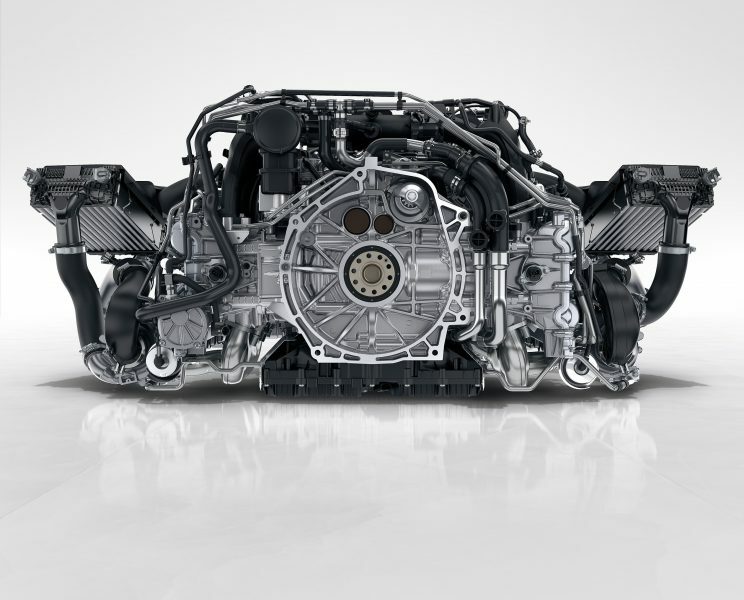 We're going to go into a bit more detail on the how/where/why of the new 3.0 liter turbo engine found in the 991.2 Carrera and Carrera S. Check it out! The new engine is largely based on the architecture of the outgoing engine, but features a whole lot of changes. 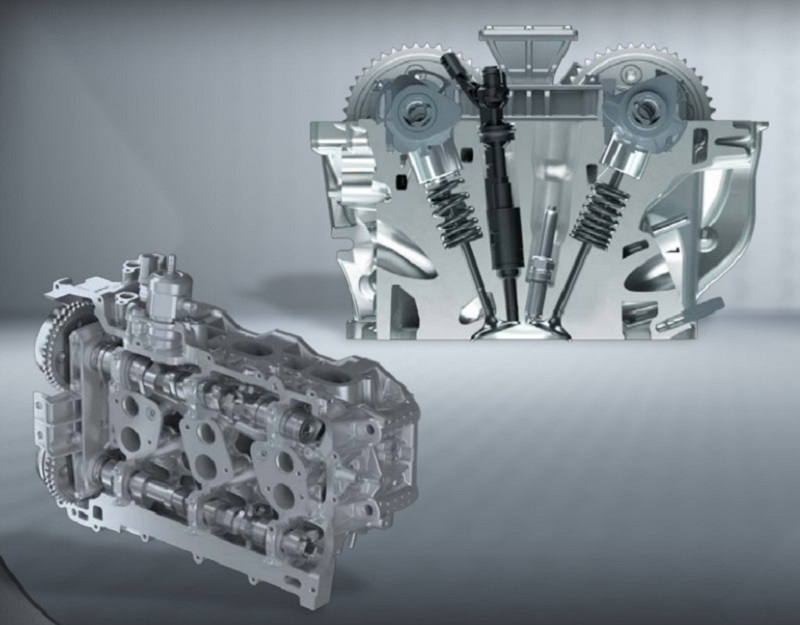 With new construction technology, Porsche has cast the entire rotating assembly inside two case halves. With new weight saving tech, the cylinder bores now feature a new "Rotating Single-Wire" (RSW) iron coated lining, which is much more efficient than a cast iron bore liner. The tech behind RSW linings is a bit above my engineering education level (quite low, rudimentary at best), but the new iron bore lining is essentially 3D printed onto the aluminum case, rather than press-fit into the opening. With fewer fasteners and that simpler RSW liner, the crankcase itself is now 3.3 pounds lighter than before. 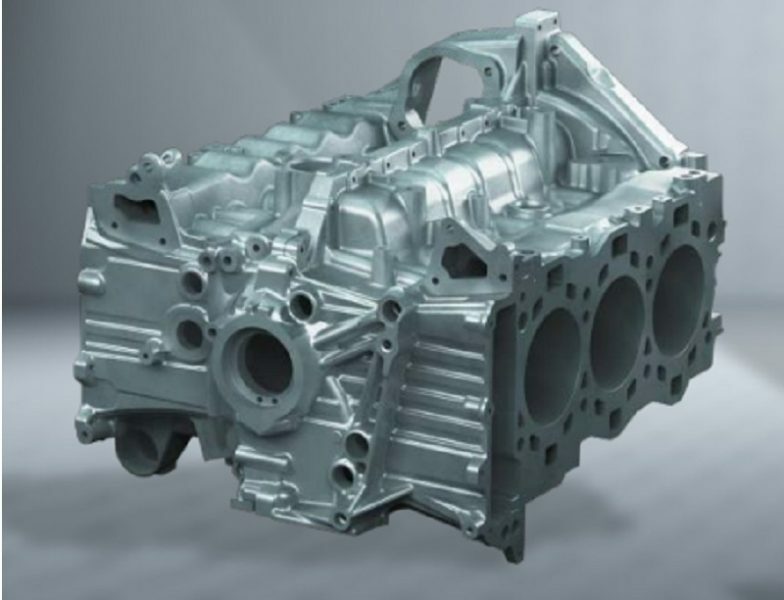 One of the major retooled areas that Porsche built from the ground up is in the cylinder heads. Given the opportunity to start over, Porsche wanted to focus on the combustion process a bit more with the new turbocharged unit. As such, they've moved the direct-injection fuel injectors to the center of the combustion chamber, and splayed the two banks of valves out to each side of it. This allows fuel to stratify more efficiently, and decreases hot-spots inside the cylinder. Because the turbocharged engine requires lower compression, the new pistons are flat-topped instead of domed with valve reliefs cut out. This new design requires less fuel to produce a similar combustion cycle. As you can see from the cutaway, the spark plug is mounted between the valves as well. This is about as efficient of a design as you can possibly engineer. The intake ports have also been engineered to promote flow with more "tumble" to the intake air than before. The new DFI injectors make use of a pair of high-pressure fuel pumps that are capable of up to 3625 psi. The new placement, combined with the new injector, is designed to reduce cylinder-wall wetting and has a defined jet pattern to get the fuel right where it needs to be. Parked inside those new cylinder heads are a pair of new camshafts. The new cams are built with a new mixed metallurgy design that allows the lobes to be made from a different material as the shaft itself. The lobes are made separately and then grafted onto the shaft one at a time. This allows the cams to be lighter and carry less rotational mass, further easing engine revs. Another excellent adaptation of the new engine is the implementation of enhanced Variocam Plus with valve adjustment on both the intake and timing exhaust cams, increasing modulation and efficiency. 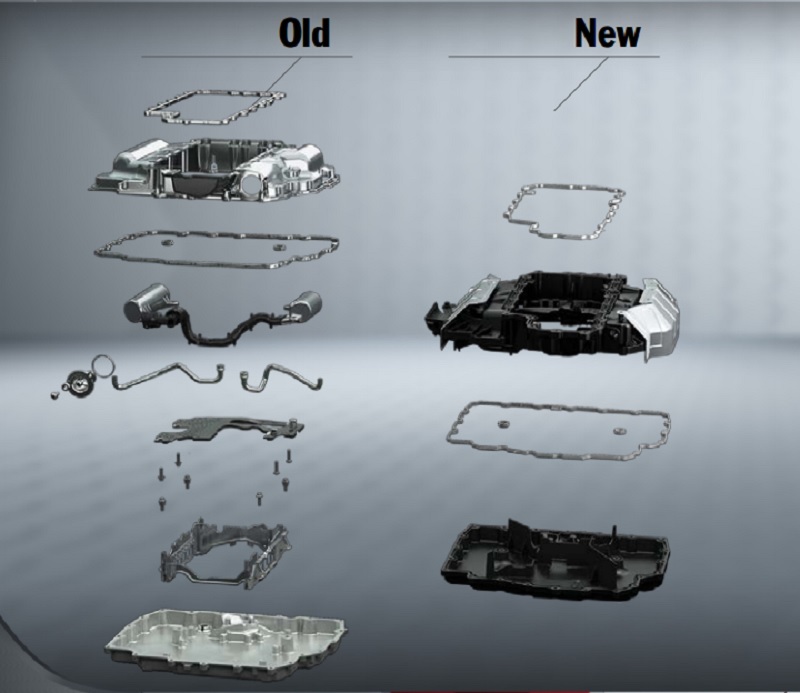 As you can see from this diagram, Porsche has drastically reduced the number of pieces needed for the oil pan. The old system was complex and required a lot more fasteners, which add weight. The new engine also makes use of a composite (read plastic) oil pan, with integrated oil passages, reducing the need for additional hoses and baffles. 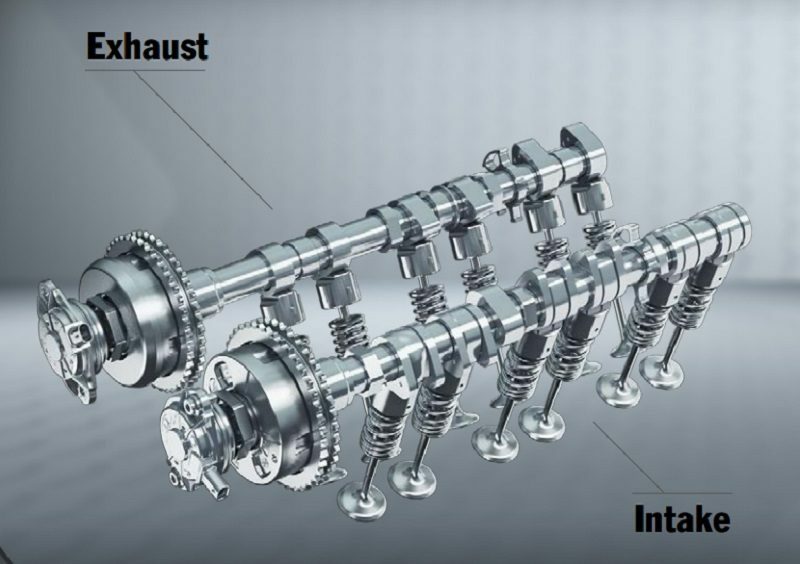 In addition, Porsche recreated their modular oil pump that has full control over when and where the oil pressure is needed. The outgoing pump was also modular, but the new version has been reduced by 2.6 pounds, and takes up less space in the engine. This new version takes less energy to drive it, which means it produces less parasitic drag on the engine, allowing more of the engine's power to go to the wheels. Like the oil pump, the new water pump is also controllable. While the engine does still make use of a thermostat, there is another way to increase the efficiency of the cooling system, while allowing the engine to warm up quicker on cold starts. When the engine is cold, the new water pump will push a shroud out to surround the water pump impeller. When the shroud is in place, the pump is not flowing water throughout the entire cooling system, allowing the coolant to sit still and absorb heat more quickly. Once the engine has warmed up, the shroud will retreat again and allow the pump to push all of the water where it needs to be to keep temperatures normal. This faster warm-up procedure allows your Porsche engine to warm up faster, and a warm engine is a more efficient and longer lasting engine. This is better for fuel economy, as well as engine longevity. Mounted down low in the chassis, the intercoolers are high-efficiency units of aluminum that help transfer hot compressed air into cooler compressed intake air. The cooler ambient air is brought in through the engine lid grille and piped down to run over the fins of the intercooler. The hot air is then expelled out through the lower rear bumper grilles, as pictured above. 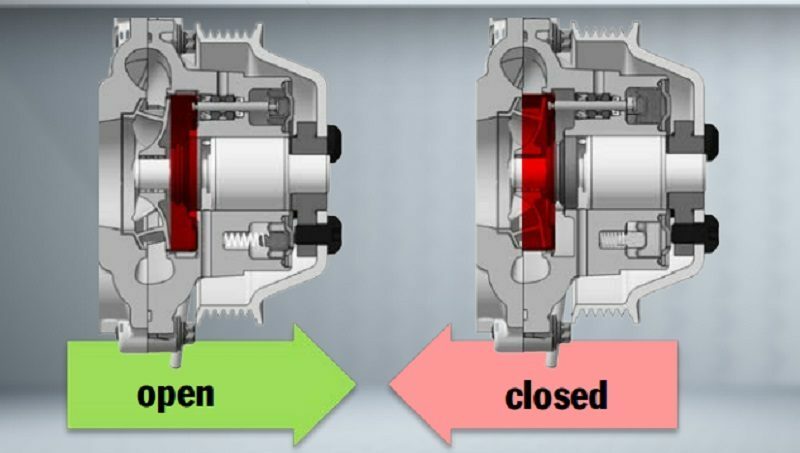 In both the Carrera and Carrera S, the turbochargers feature 45mm turbine wheels, but the compressor wheel in the Carrera is 2mm smaller than that of the Carrera S (49mm vs 51mm). The Carrera maxes out at 13 psi, but the Carrera S can produce up to 16 psi. In either case, the engines are very powerful and very responsive. Based on our experience of several hundred miles in the new 911, we can definitively say that we love the new turbocharged Carrera models, and wouldn't hesitate to recommend one to a friend. The new engine is more powerful, but delivers that power more linearly. The sounds might not be quite as evocative as those in the older 911, but they're still pretty awe-inspiring. If you're not convinced by the tech behind the new engine, then perhaps you should read more about them directly from Porsche and/or take the time to go drive one. I guarantee you'll love every second of it. Dr. Ing. h.c. F. Porsche AG is the owner of numerous trademarks, both registered and unregistered, including without limitation the Porsche Crest®, Porsche®, Boxster®, Carrera®, Cayenne®, Cayman®, Macan®, Panamera®, Spyder®, Tiptronic®, VarioCam®, PCM®, PDK®, 911®, 718®, RS®, 4S®, 918 Spyder®, FOUR, UNCOMPORMISED®, and the model numbers and the distinctive shapes of the Porsche automobiles such as, the federally registered 911 and Boxster automobiles. The third party trademarks contained herein are the properties of their respective owners. All text, images, and other content in this publication are protected by copyright. No part of this publication may be reproduced in any form or by any means without prior written permission of Porsche Cars North America, Inc. Porsche recommends seat belt usage and observance of traffic laws at all times. Gooding & Co. To Auction Ex Paul Newman Le Mans/Sebring/Daytona Winning 935! No complaints, take one for a drive you will be pleasantly surprised. in making the engine sleeve. Can you explain it? Howard, we were able to speak with an engineer at Porsche. Here’s what he had to say. Yep, they got the technology from the Aliens found at Roswell. Enjoy the joke, its worth a laugh.